HTC must feel that it’s best to underpromise and overdeliver. 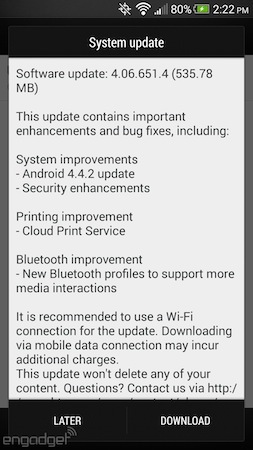 While the company told American One owners that they wouldn’t get KitKat on time, the 535MB Android upgrade is already available on Sprint; eager subscribers just have to check for an update to start downloading. More patient types can wait until February 11th, when the carrier will begin pushing the OS to all users. There’s no word of an accelerated launch on other US networks, so Sprint customers may be sitting pretty for the next couple of weeks. While Google does all it can to avoid the Android patent headache brought on by the “Rockstar” patent group, another of the consortium’s targets has decided it wants out. FOSSPatents reports that Huawei, one of seven Android OEMs suedalongside the search giant, filed a joint motion with Rockstar and its subsidiary to dismiss claims that it infringed on numerous networking and UI patents. The move suggests that the Chinese company chose the less costly option of settling instead of embarking on an expensive legal battle. Bear in mind that the Rockstar consortium counts Apple, Microsoft, BlackBerry, Sony and Ericsson as members, which closed the purchase of thousands of patents previously owned by Nortel for $4.5 billion. With a deal seemingly worked out, Huawei is free to use Rockstar’s patents without fear of future reprisals, leaving Samsung, LG, ASUS, HTC, Pantech, ZTE and Google firmly in Rockstar’s crosshairs. Huawei’s settlement prove decisive, however, as it demonstrates the group’s patent claims have merit, which could motivate the remaining phone makers to broker their own deals. The G Flex’s world tour continues: following news of launches in the US, LG hasannounced that its bendy smartphone will reach more than 20 European countries this February. The continent-wide release involves larger countries like Austria, France, Germany, Italy and the UK. LG hasn’t named carriers just yet, although we already know that both EE in the UK and Orange in France will carry the 6-inch Android flagship. Given the pricing we’ve seen so far, it’s safe to say that European G Flex variants won’t be cheap. HBO Go, Songza and Pandora are about to get more company on Chromecast, according to a Gigaom interview with Google’s VP of product management Mario Queiroz where he stated additional waves of apps are coming soon. A public release for the Chromecast SDK — which should allow developers to build and release their own apps at will — won’t happen until next year, but this week the team gave over 40 developers access to a preview version just to get their feedback. To ensure its elegantly simple user experience remains intact across all applications, the company also recently released a 14-page design guide that details the basic expectations for the development community. An impending international release next year is also encouraging publishers to make compatible apps — moves that should benefit everyone, regardless of where they call home. Quieroz’s “broader” goal is to establish Cast tech as a standard embedded into other hardware, but until that happens there’s still time to gift-wrap a few of Google’s HDMI dongles and look like a hero all year as their capabilities continue to expand.